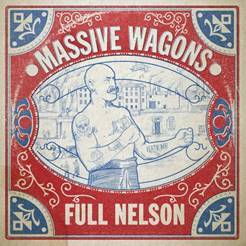 After eight years of scintillating live shows and two acclaimed studio albums, Lancashire feel-good rockers Massive Wagons are finally getting the widespread plaudits and exposure they truly deserve. A record deal with Earache Records and the full throttle new album ‘Full Nelson’ has the potential to push them over to the big time. 12 tracks of quintessentially British Hard Rock N Roll and a live energy that is impossible not to get swept up in; mainly thanks to singer Baz Mills’ mesmerising, animated and infectious showmanship and the bands’ musical muscle. Features hits such as ‘Under No Illusion’, ‘Back To The Stack’ and ‘Robot’.